Not all gutter installation options are the same, and it’s important to choose the one that is best suited to your home. At Roland Slate Service Company, we take the time to work individually with each one of our customers so that we can learn about their homes and recommend the best possible gutter products. Unlike many of our competitors who offer a cookie-cutter, one-size-fits all approach to gutter installation, we provide customized gutter solutions that will be the perfect fit for your home. These are our most popular gutters and come in both aluminum and copper. These gutters have a traditional appearance and are also available in aluminum or copper. 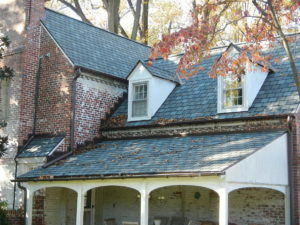 These gutters are built into the frame of your home for a seamless appearance and are commonly found on slate roofs. In addition, we also offer installation of gutter guards to help prevent clogging so you never have to clean your gutters again. By ensuring proper runoff of rain and snowmelt, you can avoid such hassles as topsoil erosion, streaks and stains on your outer walls, and basement flooding. To learn more about all of the gutter installation services we offer, contact Roland Slate Service today. We would be delighted to tell you everything you want to know during a free consultation at your Bethesda, MD, home.